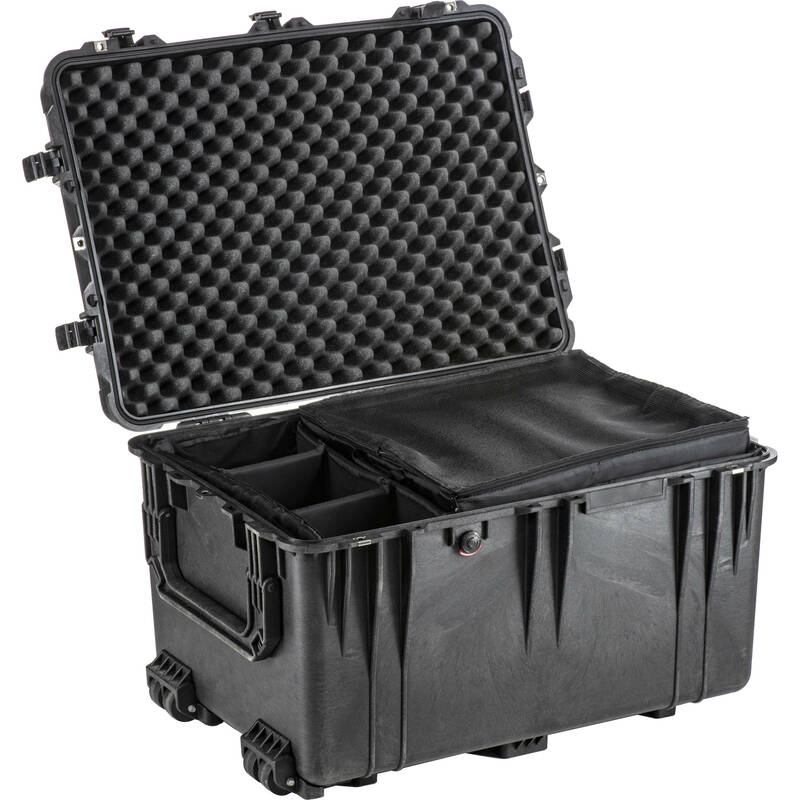 The Pelican 1664 Waterproof 1660 Case with Dividers (Black) is an unbreakable, watertight, airtight, dustproof, chemical resistant and corrosion proof hard case used to carry any kind of equipment that needs to be protected from the elements. It is made of Ultra High Impact structural copolymer that makes it extremely strong and durable. It has a 0.25" (6.4 mm) neoprene o-ring, ABS latches that seal perfectly and includes an automatic purge valve for quick equalization after changes in atmospheric pressure. The 1660 comes with large two person side haul handles, a fold down top handle, a retractable extension handle and strong, built-in polyurethane wheels with stainless steel bearings. It has an effortless release latch for the extension handle. The padlock protectors provide added strength and extra security against cutting and theft. This case has a 28-piece padded and flexible divider set. Box Dimensions (LxWxH) 32.0 x 23.0 x 19.0"
1664 Waterproof 1660 Case with Dividers (Black) is rated 5.0 out of 5 by 6. Rated 5 out of 5 by diddy from Another great case from pelican this is my second case from pelican, and i'm still happy with how great they are, this case is big, but it holds a lot of stuff, one big reason i got this case is the fact i can put my tripod in the bottom (or light stands if they are small enough), i never have any fears about keeping my gear in here, the wheels are great cause you need two people to be able to carry this easy i use this case for my lighting gear and lenses, it seems like a good fit for that, lights and battery boxes in the bottom and lenses and camera bodies on top the pull out tray seen in the picture is a nice thing to have, it allows you to pull the tray and get the gear out of the bottom pretty easy, all around great things to say about this case only thing i will say is this case full can be heavy, but that all matters on what you put in it. Rated 5 out of 5 by Danny from Large, but Perfect! With my purchase of the Canon C100 Mark II I wanted a case that I could continue my drop and go approach with equipment. What I mean by that is, I prefer not to tear down lights, mic's, lens' etc. I prefer they stay attached as I tend to move quickly from one location to another, as most wedding photo/video folks do. This is not a light case, but it now holds what was once in my 1620 and 1510 Pelican cases. I have the divider set, and the mesh topped zipper enclosed tray is wonderful, from batteries to lens' I can pull the tray without worry of spilling or damaging the equipment it holds. Fully loaded, I would place the case at nearly 80lbs, so it is not for everyone wanting to throw it into the back of an SUV. But if you can, or if you have help, this is an amazing case. Side benefit ... I leave my little two-step ladder at home, just use this case to stand on for elevated shots ... works very well. This is the 4th Pelican case I have purchased, the first over 15 years ago and I am still using it ... gear is expensive and always changing, Pelican with the velcro dividers changes right along with me. This case will hold a Canon C100 Mark II with shotgun mic attached, all I need to do is place lens cap on and drop in place. Perfect. Rated 5 out of 5 by PrimeImages from PERFECT CASE FOR ON-SITE PHOTOGRAPHY This is the perfect size case for any on-site photography. The case with dividers can fit all my 5 Photogenic lights, cords, and light modifiers. It even has a separate top compartment complete with padded dividers for camera bodies and a whole bunch of lenses. Like any large cases, you need 2 guys to carry this case (though it has wheels). Rated 5 out of 5 by Michael B. from 1664 Waterproof 1660 Case with Dividers I have 2 other pelican cases and this one is a huge one but it can carry a lot of my gear in one big box! Not to mention it is insurable on plane rides and waterproof! Pelican is a high end product but you need the best to do the best! 5 star never been disappointed! Rated 5 out of 5 by quantumrider from very useful I only wished I bought it months ago and I wish it had larger wheels, I guess to minimize shocks as rolling on the sidewalk I will need to get one of those carts with big wheels, that will help me anyway with Tripod and the rest of my gear. Rated 5 out of 5 by Pro Res from Huge case This case can hold 2 Sony Fs100 Cameras, rigs @ rails, enough lenses for a shoot and all your audio gear. The only thing left outside the case should be your tripod(s). I LOVE the padded dividers.. You should never get the foam. How would this case fare up against one of the Think Tank Airport 3.0 model roller backpacks? The Pelican is 55lbs and the Think Tank is 12lbs. I have see a lot of people with one or the other and didn't ask when I had the chance. I do have a 35 y/o Halliburton Large case but it needs foam and isn't large enough. I would suggest a better comparison would be between the Think Tank Photo Airport TakeOff V2.0 Rolling Camera Bag (Black) B&amp;H # THATV2RBP and the Pelican 1510TP Carry-On Case with TrekPak Divider System (Black) B&amp;H # PE1510TPBK. They both carry about the same amount of gear, are about the same size and both meet airline carry-on regulation being less the linear 45 limit. The Pelican is cheaper, more utilitarian looking, heavier, and hard while the Think Tank is more expensive, more attractive looking, lighter and softer. However, the Pelican can be thrown into a lake or be driven over by a car. The choice is yours.